corainder recipes. dhania recipes. Coriander or dhania, is one of the most renowned herbs in the world. Since it is an herb, it never is the hero of any dish but instead works as a base flavor provider in many. It is also a used as a garnish, sauce or a condiment. Not only that, it also provides vibrancy to any dish due to its bright green color and a raw, earthy taste. Coriander leaves don’t even need to be cooked, they can be had raw but it has to be ensured that they are thoroughly washed. Chutneys and sauces are game changers of any recipe or dish you name and no food will be same without them. In India especially chutneys hold a great place in our heart, the most beloved being the famous Green Chutney. Herby and delicious, made with both coriander leaves and stems, this chutney is used a dipping sauce or condiment for street foods like vada pav, sandwiches, chaats or served with dhokla, paratha and what not, the possibilities are endless! You can different combinations with this as well like Coriander Mint Chutney and Coriander Onion Chutney with the slight tanginess of tamarind to be served with South Indian Snacks. Coriander Green Gravy is a slightly peppy, tangy gravy that goes well with an array of vegetables. It can be made beforehand and stored in the refrigerator and used as when to make tongue tickling subzis. If you’ve ever been to Chinese and restaurant and tried to figure the condiments they serve other than soy sauce, then look no further! The green sauce is called the Coriander and Garlic sauce and it is mildly sweet in taste to complement the saltiness of the cuisine. Coriander leaves are such a fun ingredient to put in soups and broths because they provide a pop of color and earthiness to it. Lemon Coriander Soup, a healthy Indo-Chinese soup with a zesty lemon taste and punch of coriander, is a perfect nutritious beginning at the start of a meal. The twosome of coriander and coconut is used in a lot of subzis but they work wonderful together in a soup as well. With the sweetness of Green Peas added to it, Green Pea, Coconut and Coriander Soup is an absolute winner. Not only these, you can add coriander leaves to any soup to enhance its flavor. We know that snacks are served with coriander chutney, but you can even use coriander in the snacks itself. Sprouted Matki and Coriander Uttapa is made with a batter of sprouted matki and coriander rather than just sprinkling it on top like in a regular tomato onion uttapa, which enhances the flavor together with green chillies and cumin. Coriander Upma is a beloved snack made with rava and amped by mixing it with green chutney! There is no limit to which we love snacks and are always looking for something more innovative and impressive than the last thing we ate. That’s where coriander comes in handy as it increases the value of simple snacks by just being there and providing a different taste altogether. Corn and Coriander Panki and Mini Nachni and Coriander Khakhra are very good examples of this! Kothimbir Vadi, as the name suggests, are besan and coriander steamed dumplings, mostly famous in Maharashtra. Indians use coriander on a daily basis in their regular cooking whether just as a garnish or a gravy. Coriander makes for a very innovative gravy for subzis, Mushroom and Coriander Subzi being a great example of that. Here the mushrooms imbibe the flavor of the coriander and make a delectable subzi. If not in gravies, you can make Coriander Rotis to provide a certain amount health factor to the wheat rotis. Simply making Coriander Rice will also get you really excited for dinner! Coriander Curd Rice is a specialty of the south. Steamed rice is mashed together with curd and dhania, with a tempering of rai and kadi patta and served cold for lunch. It is absolutely delicious and simple to make. Street food of India is incomplete without this wonder ingredient. Raw coriander is used as a garnish on various chaats like Sev Puri, or to give freshness to Jini Dosa or also as one of the main ingredients in Vada Pav! 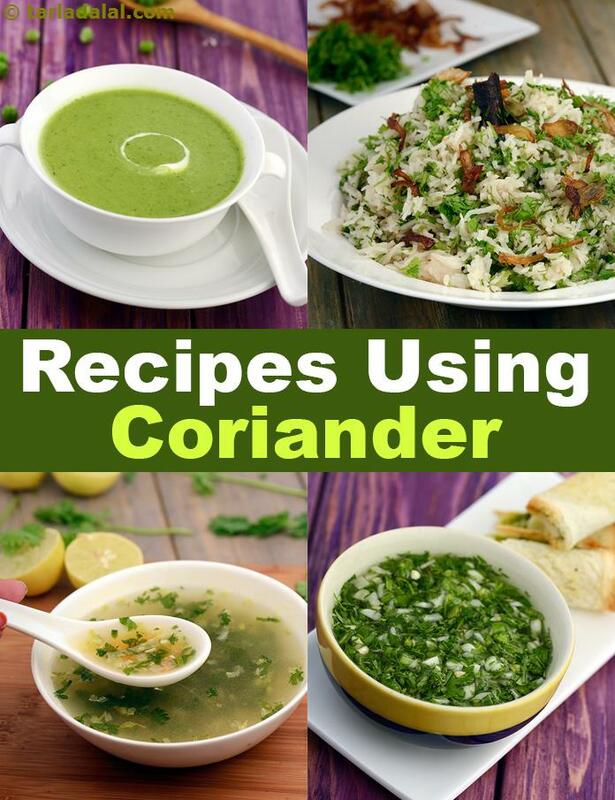 Hope you liked this collection of Coriander recipes. For more such recipes, scroll down below!